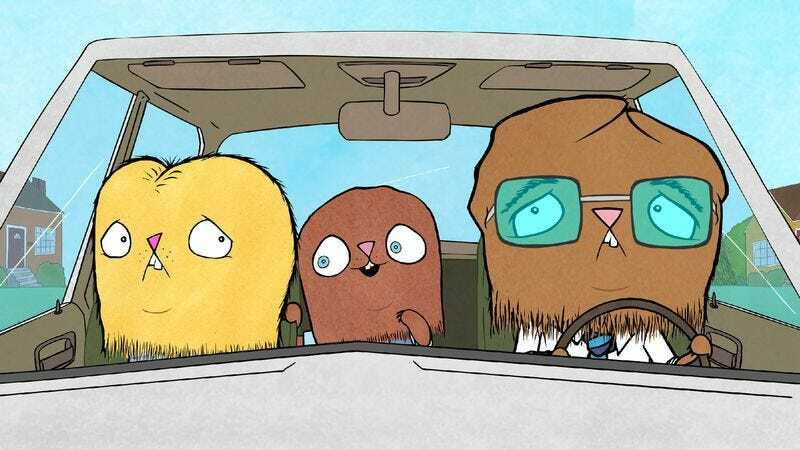 Out There is a much sweeter, gentler-spirited show that you might guess from its pedigree—the series’ creator, Ryan Quincy, was previously best known for his work on South Park—or even from a random glimpse. It’s certainly a better show than I guessed it might be from my first taste: For some reason, IFC chose to run the third episode instead of the pilot as a “sneak preview” before the series got running, and it turns out that the pilot is beautifully shaped to help viewers get their bearings and tune them into the show’s sensibility. IFC may have thought such considerations were irrelevant when it came to some crazy underground cartoon show, but Out There isn’t the second coming of Unsupervised. At its best, it does as good a job of plugging into the comedy of feeling like a teenage pariah as any show since Freaks And Geeks. The hero, Chad, is 15, attends Holford High School somewhere in the Midwest, and is intensely aware of being a nobody trapped in nowhere. Chad is the kind of wary, thoughtful kid who sees his high school years as a necessary transition period, something to be endured: If he can just make it through to the other side, he’ll be an adult, someone with autonomy in a world where pre-ordained social status isn’t everything, and then his life can start. His best friend, the more reckless Chris, is a “seize the day!” type who can’t wait; he’s convinced that if he can just come up with the right stupid stunt, he can rewrite the rule book on high school popularity, and the world will be his. (He describes himself as a “mischief maker” and a “hullaballoo-haver.”) Chad (who Ryan Quincy voices himself) is the heart of the show, but without Chris, it wouldn’t have much of a motor. The show's wildest stroke is that Chad is designed to look like a hairy, toothy beast-boy—as are both his younger brother Jay and his father, which suggests that, for some of us, being a natural outsider is something that sets in early and is never fully grown out of. (It may take a while before it hits you that, as much as anything feral and unpleasant, Chad looks like a miniature version of the unhuman romantic hero of Cocteau’s Beauty And The Beast.) But the character design of Chris may be even better. With his eyeglasses, shaggy hair, and overalls, he looks like a 15-year-old, white trash Ray Manzarek, and he’s instantly likable in ways that plainly do not translate to his adolescent peers—except for Chad, who’s smart enough to know that Chris’ mad schemes can’t work but feels bad enough about his own cautious nature to admire him for having the courage to keep getting up after every failure. That line encapsulates a lot of Out There’s recurring themes, as well as what makes the series deserve a second season. So does the subplot, about little Jay wanting a rad new bike to replace his brother’s hand-me-downs. Explaining why he needs his father to shell out, he explains that the bike he has “is lame.” His father replies, “Unless that’s code for the axle’s bent, forget it.” But Jay is something of his mother’s boy, and in a heartbreaking scene, Mom proudly presents him with a new bike she’s scrimped and saved for: A darling little-sissy-boy horror designed to make any lad’s testicles retract. Jay tries his best to appear delighted, and enters it in a bike race. He comes in last. But Mom, having sat in the stands and heard swinish onlookers making cruel sport of Jay and his bike, rolls up her sleeves and pimps his ride, transforming it into an awesome-looking off-road machine dubbed “the Black Rose.” He enters it in another bike race, and again he comes in last. But it’s still a happy ending, because the bumpkins in the stands are so dazzled by the Black Rose’s cool makeover that they barely notice that anyone came in first: Flash beats actual accomplishment every time. Jay may be going into high school better armed than his older brother was. Suggesting to some girls that they “have lunch” together, Chris really puts his all into making “You bring the P, I’ll bring the J” sound just filthy.